Pictured here: a very good outfit. Yeah, you heard that right. 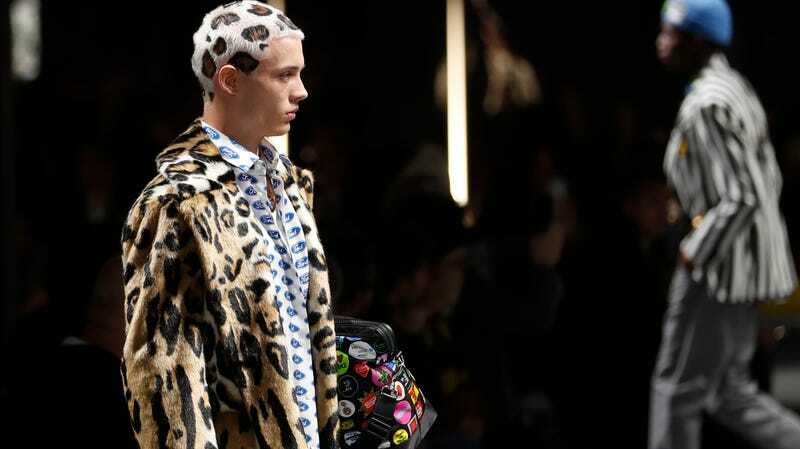 Ford Motor Company has teamed up with Italian fashion brand Versace as part of the latter brand’s Fall/Winter 2019 menswear collection. It might take y’all a while to grow to the possibilities of this new collaboration, but thankfully we at Jalopnik are here to guide you on your fashion journey. Trust us: you can wear these bad boys everywhere. The Versace Man collection “reflects on the modern concept of man, an idea of masculinity that pushes the boundaries and breaks the rules of menswear by challenging notions and stereotypes. How do we challenge the norms of menswear while also just being regular guys doing regular dude stuff? Let Jalopnik explain. Versace has done it. They’ve discovered the ideal race day look. We all know I’m a big fan of wearing layers to the track, but this really just kicks things up a notch. You’ve got what appears to be a very tropical button-up tucked under a contrasting sweater which is also tucked under a big ol’ jacket. You’re gonna be ready for everything mother nature throws at you! And those pants. They really scream “comfortable fan” don’t they? Davidman predicted that blending the NASCAR crowd with high fashion is going to be revolutionary for both industries. This is your time to shine, Race Fan. Be the future. Don’t be afraid to be bold. Pair your unbuttoned Ford button-up with your Ford sneakers and Ford necklace the next time you and the fellas hit up the local sports bar to watch A Big Game. Throwing on the leopard-print fur coat you have laying around is really just the cherry on top. The exact terms of Ford’s deal with Versace are confidential, but you don’t have to be quite so mysterious. If you don’t wear all of your statement pieces all at once, then why buy ‘em in the first place? The bonus? A little outfit change and you can hop in your Mustang for a little late night cruise. This is the versatility of masculinity that Versace is after. Have you been dying for a Ford hoodie but just don’t think spending up to $100 at the Ford merchandise store is enough? Versace has you covered. While there’s no price for this specific piece yet, Versace hoodies at Neiman Marcus can cost up to $1,125, perfect for when you want that blue collar flair at a high-brow price. Partnerships between the automotive and fashion industries aren’t new—think of all the years Mercedes-Benz or Lexus have sponsored big fashion weeks across the globe, or how Kia debuted the 2020 Telluride at a 2018's New York Fashion Week. There’s a push to break down the barriers between car people and clothes people, one that Versace and Ford have obviously considered important enough to take advantage. So rock your automotive gear with flair—you, too, can be on the cutting edge of high fashion.